It’s a good idea to use an SPL meter to check your monitoring levels. Most of us listen too loud, both for accuracy reasons and for health reasons. 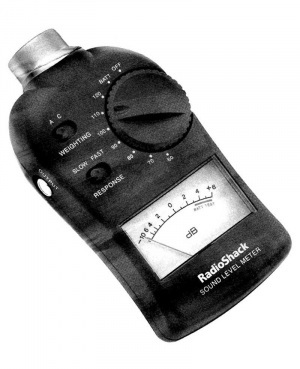 Spend $30 on a Radio Shack SPL meter (the analogue one, not the digital one) and set it for 80/C weighted/Slow (you’ll understand when you get it). Place the device near you pointing at the speakers, maybe on the other side of your keyboard opposite your mouse (you are using a computer right?). Then play some music at the level you usually play it at. The needle should be dancing between 0 and +6. If you peg the needle you’re killing yourself and probably are deliver- ing bass light mixes. If the needle is not moving you’re either using a dead battery or you are one exceptional human being with phenomenal self control on listening levels (and you are probably delivering bass heavy mixes too). A good way to normalise monitoring levels and to deliver consistent mixing results is to use a reliable volume control like the Dangerous Music Monitor ST. First you set a level for a mastered CD in the style you like to work in to hit the magic + 0 to +6 spot on the SPL meter. Memorise that volume knob position. Then play one of your unmastered mixes and set a position for that. It should be quite a bit higher because your mix is not (yet) limited to within an inch of its life like the mastered CD is. Now you have to reproducible mixing positions: one for mixing and one for listening to mastered CDs with the benefit that both will now play at the same SPL level. Only then can you really start comparing your work with the work of others without fooling yourself. Isn’t that wonderful?